IT'S ALL ABOUT THE VIEW, not to mention you can't beat the price! This ocean front condo has beach access within 60 seconds of our door. It sits approximately 20 feet above sea level and is located less than 15 feet from the waters edge. The view is nothing less than spectacular. An enlarged 1st floor terrace with a roof for shade allows you to enjoy ocean front dining or to just kick back and enjoy the sights and sounds of the ocean. A newly installed shade sail on the spacious 2nd floor terrace provides a beautiful view while allowing for protection form the sun. Granite countertops in kitchen and an enlarged bedroom make this unit unique within the resort. Direct TV with CNN, Disney, Discovery, Nat Geo and many more. Lounge in the pool just outside your back door or walk down the steps to snorkel or dive at Playa Lagun. Two dive shops and two restaurant's are located next to our property with lots of other restaurants within a 10 minute drive. Christoffel National Park and Shete Boca are about 15 minutes away. The Island of Curacao has many wonders to enjoy. Take in the most beautiful sunset you've ever seen, snorkel before breakfast, dive right from our beach, teach your children to swim or eat at one of the two restaurants located at Playa Lagun. All of this are at your fingertips from Lagoon Ocean Resort. The ocean is calm and the sea life is abundant. The climate is warm, yet our trade winds keep you comfortable. Curacao is located outside the hurricane belt next to Aruba in the Caribbean where it never rains for very long. You are sure to run out of time before running out of things to see and do. We have a full time Resident Manager on site to attend to your needs and ensure a carefree stay. If you are arriving late, let us know and we can arrange to have a small food/drink package waiting for you. Please take a few minutes to read our reviews. We have owned this unit for more than 12 years and believe our service is what helps make this island paradise your home away from home. But don't take our word for it, read what others have to say. If you have questions, please ask. We sold a unit in a nearby resort a few years ago and would be happy to share the reasons why we love this location the most. Ruth & Scott bought this unit in 2006 and are personally involved with every aspect of managing this second home. Why you should rent this property? We recently added a shade sail to the 2nd floor terrace and completed a minor renovation expanding our 1st floor terrace and adding a roof for shade. 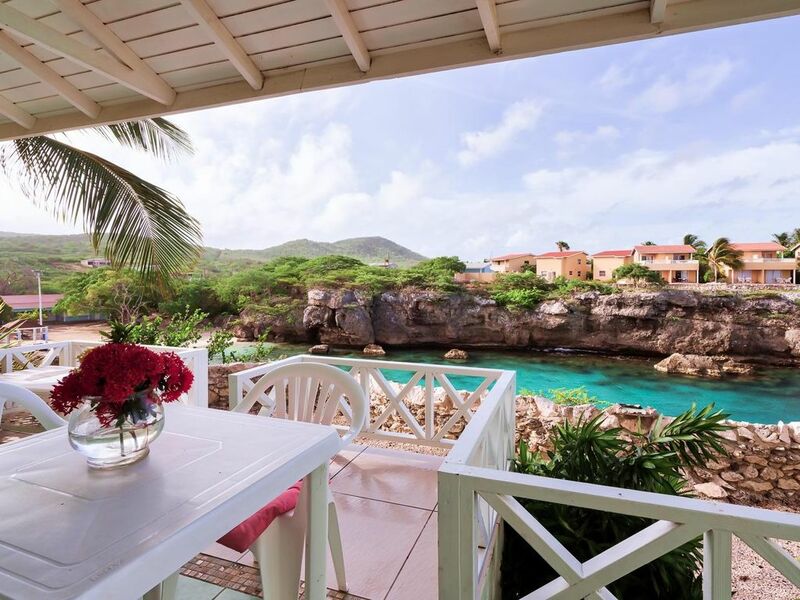 Its perfect for oceanfront dining or just kicking back and enjoying the ocean view. Since we don't use an expensive management company, we pass the savings on to you. Compare our bottom line price with any other ocean front unit in our resort and we'll be lower...we guarantee it! View...View...View and proximity to beach with great diving and snorkeling. This unit has more upgrades than any other unit in the resort and rents for less than any other ocean front unit of its size. Two restaurants and dive shops are available at Playa Lagun. Electric to run Airconditioning extra. Shower towels provided buy not beach towels. Stovetop and toaster oven but no oven. Direct TV with CNN, Discovery, Disney, Nat Geo, Video, Music and many many more. Thanks Robert, glad you had a nice time. We loved being in Curacao Condo is nice and close to the beach and has everything needed for a vacation . Scott is a very good host . Communication with him was very easy . We just left from a week at Scott's condo at Lagoon Ocean Resort. We had an amazing time and the photos are accurate. We had one small hiccup with the stove and both the owner as well as the caretaker were quick to offer assistance. The WiFi worked well enough for us to check emails, and WhatsApp messages etc. The lagoon itself was stunning, never busy, and the snorkeling was top notch. We saw a plethora of fish, occasional turtles, and got really lucky on our last swim when saw a spotted stingray. You will definitely need sunblock and it's a good idea to bring some bug spray. We made a few trips to local supermarkets for basics, sandwich food, and charcoal for the BBQ. With a car, there's many nearby beaches each with its own reason for visiting. No reasonable traveler would be disappointed with this rental. We had all the amenities, there was an ice chest, beach chairs, and all we needed to be able to cook at the house as we wished. Everything worked and Ivy, the lady who provided the key and gate code, was always available fir any questions. Had an amazing time, will definately return and rent from Scott again! My 10yr old daughter and I traveled out of the US for the first time and we chose this condo as our first experience. The views were amazing and the small gated resort was perfect, quiet, safe, and cozy. We had friendly people all around us and easy access to the beach. The pool was right out the back door. The entire experience was very easy, Scott is great to work with. Ivy, the caregiver, is a gem. We were fortunate not to need to contact her on the 9 nights we stayed, but she did come and clean the room a few days in. She was non intrusive and gave us time to get out of the room and out of her way (my choice, she wasn't running us out ;). We ate out most nights but there were pots and pans in the condo if we did chose to eat in. The back porch was my favorite part. The birds on the island are beautiful. So colorful, just like the buildings. We saw a pod of dolphins swim by one morning. They took about 5 mins to swim past the opening to the cove, so it was a nice treat to see. We only saw their little arched backs and fins but it was still neat to watch. The snorkeling right off the beach is great but there are also several really nice beaches within ten minutes of the condo. We saw turtles and all kinds of beautiful fish and crabs. We are planning a return trip next year and Scott's place is at the top of our list. You can't beat the price of Scott's condo for the views you get. Everything was perfect. Thank you Scott, for sharing your place with us. Will definitely stay again if we go back to Curacao! A 30% deposit is required to confirm a reservation. The balance is due 30 days prior to your arrival. We gladly accept personal checks or credit card payment via PayPal. A 3% charge is required to clear payments made via PayPal.